I met with a new family doctor this week whom I absolutely adore, but one of the things she suggested to me was to try to eat fish at least once a week. I don't like fish. At least I think I don't. I have to admit, I've never tried every single fish out there. In general, however, fish and me don't get along. But I have decided that before I spend my entire life thinking I don't like ALL fish, I will make an attempt to try different types of fish to see if there's anything I do like, or at the very least, tolerate. 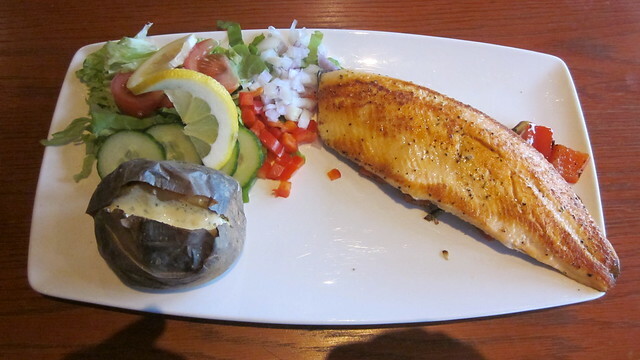 I had a taste of this back in June when my husband and I went to Iceland and I had Arctic char for the first time. It was phenomenal. It was light yet meaty and had a mild salmon flavor. I could deal with fish if it all had the taste and texture of Arctic char. But Arctic char is like $18 a pound, so you know, I should probably see what else is out there if I want to make an attempt to eat fish once a week. When I was at Whole Foods this weekend, I actually strolled over to the seafood counter, which I usually quickly bypass on other trips to the grocery store. This time I made an effort to talk to the lady behind the counter to ask her about the different kinds of fish and what she would recommend for someone like me who doesn't generally like it. She suggested catfish since it has a mild flavor and is great for grilling. So I bought four small fillets of catfish and grilled them for dinner. They weren't bad. I didn't LOVE it, but the mild flavor didn't send my gag reflex into overdrive either. So overall, it was a successful attempt at trying something new. Believe it or not, this encounter made me think about how my aversion to fish is not unlike reluctant readers. Reluctant readers think they don't like all books, when in reality, they just haven't found a book they really like. Back in June, I had a taste of a fish I really like which allowed me to be curious about what else is out there. Teachers, don't give up on those students who turn their nose up at books. It's your job to try to find them their Arctic char. To be that fish monger who won't give up on finding them their perfect fish that won't make them gag. Or something like that. It sounded better in my head. I also occasionally eat red snapper, but it can be pricey.